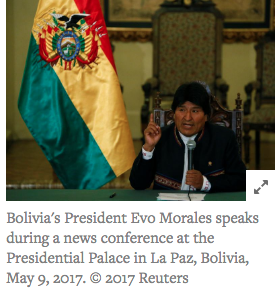 (Buenos Aires) — President Evo Morales of Bolivia seems obsessed with staying in power. In 2016, he called a referendum on a constitutional amendment that would have eased term limits in the country’s Constitution and allowed him to run for a fourth time. After 51 percent of the voters rejected the amendment, President Morales came up with a new plan. In September, his supporters in Congress brought a lawsuit in the Plurinational Constitutional Tribunal seeking to revoke the Constitution’s term limit. Mr. Morales had already brought a lawsuit to the high court in 2013 to bypass the two-term limit. That time the constitutional court concluded that the president’s first term, from 2006 to 2010, did not count because it took place before the 2009 Constitution came into force. Now Mr. Morales’s supporters claim that the term limit discriminates against the president and undermines his political rights under regional human rights standards. They rely on a provision in the American Convention on Human Rights, the main human rights treaty in the Americas, which says that political rights can “only” be limited under very specific circumstances. The interpretation they promote seems far-fetched. The clause was designed in 1969 to prevent abusive governments from arbitrarily barring opposition candidates, not to impede constitutional re-election limits designed to prevent the rise of autocrats. Many Latin American politicians have bypassed term limits, at times undermining the rule of law in the process. Álvaro Uribe of Colombia amended the Constitution to seek a second term and, in 2010, sought a referendum to put a third term to a vote. The Constitutional Court stopped him. Yet many in Colombia believe that by lifting the presidential mandate once, Mr. Uribe undermined the checks and balances in the Colombian Constitution that were designed to ensure that presidents are held in check by officials nominated by their predecessors. Mr. Chávez died of cancer in 2013, but had he survived he would probably still rule Venezuela. The erosion of checks and balances he carried out has enabled his successor, Nicolás Maduro, to go further still so that he is now able to intimidate, censor and punish his critics with impunity. In 2015, Rafael Correa promoted a constitutional reform to allow indefinite re-election in Ecuador. After mass protests he had to compromise by ensuring that the new provision could apply only to future presidents. Yet he warned that if the opposition won the 2017 presidential race, Congress could call for new elections, and he would “run again and win.” Mr. Correa’s candidate, Lenín Moreno, won and is surprisingly among the few presidents in the Americas who have sought to establish term limits where they are lacking. What makes Mr. Morales’s strategy unusual, however, is that he has the nerve to invoke human rights to cling to power. There is transparent hypocrisy in his argument that international human rights law bars the Constitution’s term limits. In the past Mr. Morales’s administration has frequently contended that sovereignty should trump rights. Yet Mr. Morales’s move is not unheard of. In 2009, Daniel Ortega of Nicaragua also played the human rights card. He successfully brought a lawsuit to the country’s Supreme Court of Justice to lift the term limits set forth in his own country’s Constitution. Mr. Ortega ruled in Nicaragua throughout the 1980s and has won two re-elections since he regained the presidency in 2007. When his current term ends, he will have had 24 years in power. Mr. Arce, the justice minister, has promised O.A.S. members that Bolivia’s constitutional court would rule with “absolute independence and liberty.” Yet doubts remain. The sitting magistrates were appointed in 2011 through a widely criticized process that was controlled by government supporters in Congress. Yet Mr. Morales has progressively undermined many of the checks and balances that are cornerstones of any functional democracy. In 2013 he signed a decree that grants the government wide latitude to interfere with the operation of independent civil society groups. And since 2016 his administration has been pursuing a troubling reform to the judiciary that poses a serious risk to judicial independence in the country. After years of silence, in 2017 leaders across the Americas spoke up against the grave abuses of President Maduro’s authoritarian government in Venezuela. Yet efforts to hold presidents in the region from moving toward autocracy could be much more effective if governments reacted as the checks and balances are being dismantled, rather than wait until the situation becomes a crisis.